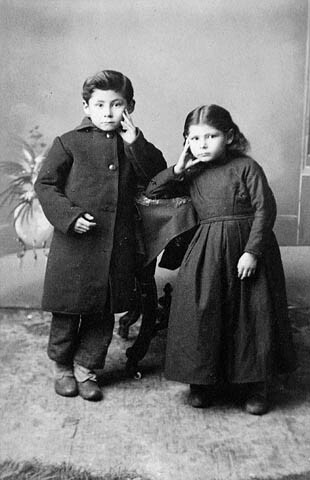 Louis is born on his grandparents Jean-Baptiste Lagimodière and Marie-Anne Gaboury’s farm in the parish of St. Boniface. Riel is the oldest of eleven children. Bishop Alexandre-Antonin Taché arranges for Riel to attend school at the Petit Séminaire de Montréal. Riel’s father dies and he abandoned the idea of joining the priesthood. In 1865, hoping to support his family in Red River, he became a law-office clerk in Montréal. Lieutenant Governor William McDougall is appointed. Knowledge of McDougall’s nationalistic vision and his links to Charles Mair and the aggressive Canada First movement precedes him to Red River where like-minded easterners, such as John Christian Schultz, have already formed the nucleus of a Canadian party. The Métis population and others in the territories resist when a team of Canadian surveyors, led by McDougall’s former schoolmate John Stoughton Dennis and Mair as the paymaster, attempt to superimpose a grid system upon traditional landholding patterns. Mair publishes a series of newspaper articles openly critical of the Métis people. He was opposed to the expedient biculturalism of the settlement. Tension rises between the Métis (now led by Riel) and the government. At St. Boniface Cathedral – Riel declares that the surveys are a threat to the very existence of “Settlement’s land”. One week later, Father Noël-Joseph Ritchot facilitates the formation of the “Comité national” in the St. Norbert Parish. John Bruce is the President with Riel as secretary. Riel tells the Council of Assiniboia (fonds) that the “Comité national” (National Committee) would prevent the entry of McDougall or any other governor unless the union is based on negotiations with the Métis and others at Red River. McDougall is met by an armed Métis patrol and ordered to return to the United States. Establishment of the Provisional Government & the List of Rights (microform). Father Jean-Baptiste Thibault and Charles-René-Léonidas d'Irumberry of Salaberry and delegates are sent to Red River by Sir John A Macdonald. Donald A. Smith, special representative for the Hudson's Bay Company arrives in Red River. Forty representatives of the settlement (20 English and 20 French) meet to debate a new List of Rights and to endorse Riel’s provisional government. Convention discusses the list with the support of Smith, Thibault and Salaberry. Riel drafts a third version List of Rights. 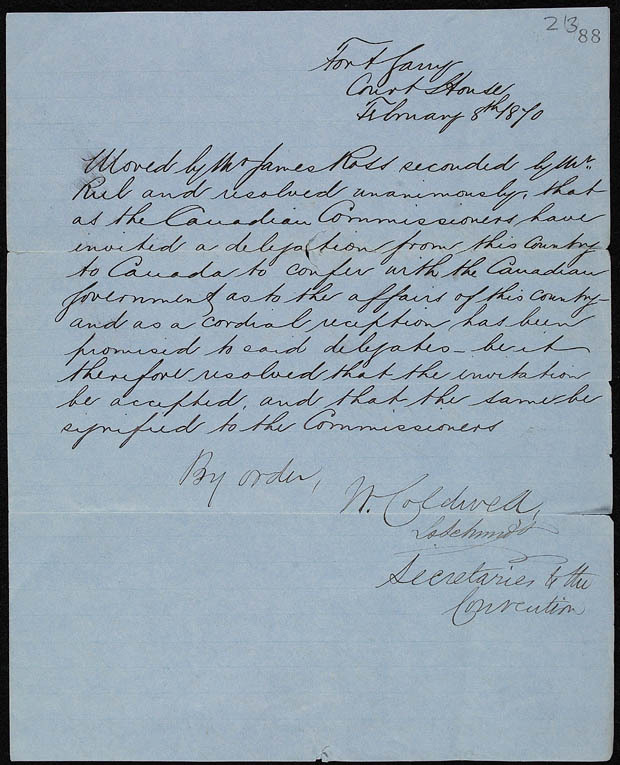 Fourth and final version of the List of Rights is sent to Ottawa with Ritchot as the representative for the Métis, Judge Black, the English, and Alfred Henry Scott, the Americans. Ritchot returns from Ottawa, Riel is pleased with the outcome. Thomas Scott is charged with insubordination, convicted and sentenced to death by a jury. Orangemen from Ontario are sent to Manitoba from Ottawa. Despite the fact that their official mission was peaceful, Riel learns that they intend to lynch him, in retaliation for the death of Thomas Scott. Riel leaves Upper Fort Garry and exiles himself in the Dakota Territory until his eventual quiet return to his home in St. Vital, Manitoba. Adams George Archibald, the new lieutenant-governor of Manitoba, begins recruiting volunteers in response to the threat of Fenian Raids from the United States. Riel leads one of the cavalry companies. A troop inspection, in St Boniface leads to a handshake between Riel and Archibald – a handshake that outrages Mair. MacDonald must avoid any confrontation between the English and the French – it is an election year. Riel returns to the United States – fearing for his life. Without contest, Riel is elected to Parliament in a bi-election on October 13, 1873. He would not take his seat. Parliamentary records state he served his constituents for 361 days (11 months, 27 days). Riel is re-elected in the General Election on January 22, 1874 and travels to Ottawa to sign the oaths’ book. Ontario Orangeman Mackenzie Bowell introduces a motion to have Riel expelled from the House of Commons when he attempted to take his seat. Riel does not attempt to take his seat, despite being re-elected. He would be again re-elected on September 3, 1874, but was unseated and declared an outlaw. Riel is admitted to a hospital in Longue Pointe (Montréal) – having suffered a nervous breakdown from years of incessant stress. He is then transferred to a facility in Beauport near Quebec City. Riel moves back to the United States, travelling between Keeseville, N.Y. (just across the border near Montreal) and St. Peter’s Mission, in the Montana Territory where he was a teacher. Riel returns to Saskatchewan when he is asked to help a group of Métis obtain their legal rights in the Saskatchewan Valley. Riel finds that the Métis and First Nations have a number of grievances. Riel is distanced from the Catholic clergy, his political ideals and his theological views have changed. Riel is convinced that hundreds of North West Mounted Police are advancing towards them, and he has made many attempts to rectify the situation with the federal government and improve the conditions for the Métis and First Nations people. He now forms a provisional government in Batoche, Saskatchewan (map of the area). English Canada refuses to validate the claims of the Métis and the First Nations – they call upon the Macdonald government to act. The Canadian militia is deployed to Batoche, Calgary and Battleford Saskatchewan. The Métis and the First Nation people resist, but cannot survive against the strength of the military. The “rebellion”/”resistance” ends. Riel surrenders. He is accused of treason, is tried in Regina, is found guilty and is sentenced to death. Louis Riel is hanged at the North West Mounted Police Headquarters in Regina. 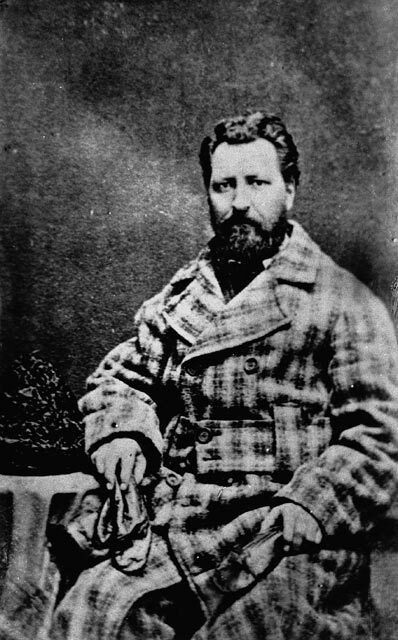 Following the execution, the Métis brought Louis Riel’s body to his mother's home in St. Vital, Manitoba, now the Riel House National Historic Site, where it lay in state. His remains were interred in the churchyard of the St. Boniface Cathedral. Widely regarded as the father of Manitoba, Louis Riel is honoured by Métis communities across Canada at commemorative events, such as Louis Riel Day, where his achievements are recognized and celebrated each year.